On Sunday July 30, Venezuela will carry out elections to a Constituent Assembly. The elections will be direct, open to all the people, and based on a secret ballot. This Assembly, with 545 delegates from all over the country, will be empowered to make changes in the nation’s laws, including the constitution, so as to help deal with the current economic and political crisis in Venezuela. The right wing opposition in Venezuela has been organizing sometimes violent protests against the legally elected president, Nicolas Maduro. These protests are now focused on stopping the Sunday elections or discrediting their results. On the same day (July 16) that Venezuelan electoral authorities carried out a successful dry run for the Sunday Constituent Assembly elections, the opposition organized a farcically inept “plebiscite” to oppose it, in which there was no secret ballot, no effort to make sure that people did not vote multiple times, and a startling decision to burn all the ballots immediately after the vote was finished. Yet the corporate controlled press in the United States gave wide credibility to this farce, and ignored the dry run for the Constituent Assembly elections. The Venezuelan right has been supported materially and ideologically in this effort by right wing governments and politicians in the rest of Latin America and in Europe. In the United States, attacks on Venezuela have been spearheaded by right wing politicians such as Republican Party Senator Marco Rubio of Florida. Unfortunately, some Democratic Party politicians have also jumped on this bandwagon. Though the Venezuelan right is vague about its ultimate goals, it is clear that, in its efforts to oust President Maduro from power, it is not aiming to produce an honest and efficient government at the service of all the people of Venezuela. Rather, the plan is to roll back the real benefits for the Venezuelan working class and people achieved since the election of President Hugo Chavez in 1998. 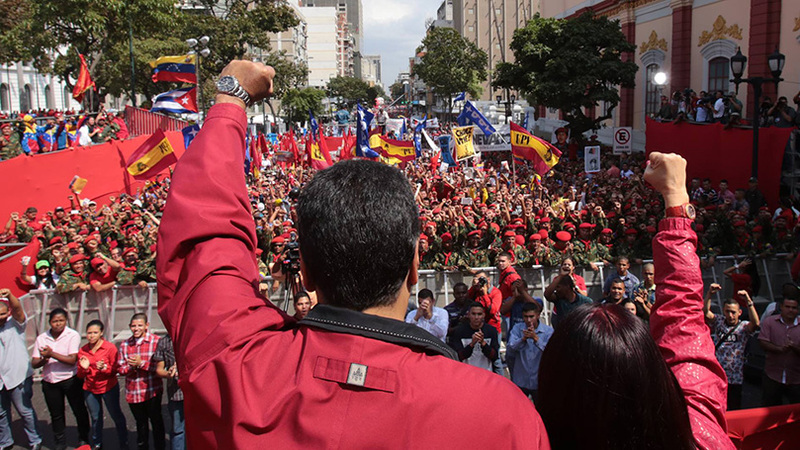 A right wing victory will be a defeat for Venezuelan workers, women, youth, small farmers, indigenous and Afro-descended minorities, LGBT people and the poor. This has been the result of right wing takeovers of the governments of Honduras, Paraguay, Argentina and Brazil. Supporters of the Constituent Assembly, including the Communist Party of Venezuela, see this body as giving these sectors an even greater voice in their nation’s affairs. On July 18, U.S. president Donald Trump chimed in, adding to his already hostile attitude toward Bolivarian Venezuela a denunciation of the plans for the Constituent Assembly elections, and threatening Venezuela with new sanctions if the election goes ahead. On July 26, Trump announced new sanctions on thirteen Venezuelan officials, including the head of the country’s Electoral Commission, as punishment for the Sunday vote. Meanwhile, Rubio and his allies have introduced anti-Venezuela legislation in the Senate and the House of Representatives, while the corporate controlled media here have continued with a dishonest course of portraying Venezuela as a dysfunctional “dictatorship”. Rubio and other right wing U.S. politicians have also made threats against Haiti and Nicaragua, two of the poorest countries in the hemisphere, because their governments refused to go along with the United States’ anti-Venezuela policy. The Communist Party USA deplores all interference by our government, including the White House, State Department and Congress, as well as the governments and politicians of other countries, in the internal affairs of Venezuela, including in the elections to the Constituent Assembly and the functioning of that body once elected. We will continue to vigorously oppose any move by the United States government to re-establish the old colonialist and imperialist relations not only with Venezuela, but with the rest of Latin America and the Caribbean as well. In particular, we warn that the connections of the Trump administration to frankly fascist tendencies, sometimes called the “alt right”, and the increase in the influence of the military on U.S. foreign policy, represent a serious new danger to regional and world peace. Venezuela is a sovereign, independent state which declared its independence from Spain in 1811, so does not have to answer to the United States government. How its government is run is entirely the affair of the Venezuelan people, whether Mr. Trump likes this or not. Moreover we denounce the unbalanced and unprofessional coverage of the Venezuela situation in the corporate controlled media here. We send our greetings to the people of Venezuela, and express our commitment to defend the sovereignty of their country against the attacks by Trump, Secretary of State Tillerson, and other politicians, media and institutions in this country. Finally, we call upon the people of the United States to reject the anti-Venezuela policy course of the Trump administration, as well as the anti-Venezuela moves in Congress, by demanding that the White House, the State Department and Congress recognize the rights of Venezuela as a sovereign independent country to run its own affairs without outside interference.